Sangyum Kamala is the spiritual consort of Chatral Sangye Dorje. She was born in the village of Pangi, near to Manali, in the northern Indian State of Himachal Pradesh into an extraordinary Dharma lineage. Her father, Tulshuk Lingpa, was renowned as a tertön in the Nyingma lineage. In the early 1960s, Tulshuk Lingpa led over 300 followers into the high glaciers of the Himalayas in order to ‘open the way’ to a hidden land of immortality fabled in Tibetan tradition dating back at least to the 12th century. He journeyed in Sikkim and propagated the Buddhist teachings throughout Tibet, Nepal, Sikkim and India in both conventional and charismatic styles. Her father was also a student of Dudjom Rinpoche, and her grandfather was Kyechok Lingpa, a famous tertön and doctor from Golok, Serta, and was a student of Dudjom Lingpa. Her mother, Phunsok Choedon was a great practitioner and dakini who devoted her entire life to Dharma practice. When she passed away at age 83, her body remained in meditation for 7 days, and a circular rainbow appeared in the sky over her room. Sangyum Kamala was raised in an environment infused with Dharma practice, the blessings of faith and the power of Secret Mantra. She met her root guru Dudjom Rinpoche together with Chatral Rinpoche in Simla at age 13. At the age of 20, she married Chatral Sangye Dorje, the greatest living Dzogchen master today. They have now been married for 50 years. 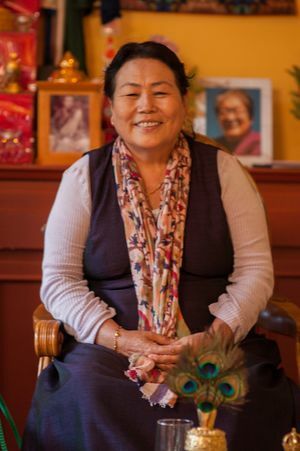 During her entire life, especially the half century spent with Chatral Rinpoche, she has received an uninterrupted stream of Dharma teachings and transmissions, and has practised mainly in the Dudjom Tersar and also in the Longchen Nyingtik traditions. Sangyum Kamala has constantly supported the retreat practice of countless sublime yogins and yoginis throughout Nepal and India under the guidance of Chatral Rinpoche, and especially she has demonstrated her deep compassion by caring for the humblest of the humble in both material and spiritual ways. She carries on Chatral Rinpoche’s example of freeing lives every year in Calcutta by releasing millions of fish into the Ganges and has constructed numerous stupas, prayer wheels, and other holy supports in both India and Nepal. Sangyum has three daughters. The oldest and youngest are both married to tulkus, and the middle one, Saraswati, is unmarried. She has two granddaughters.